Fundamentally, I’m concerned about and fixated on human interrelations — especially during the Spanish Middle Ages. From the 8th through 15th centuries, Jews, Christians, and Muslims co-existed on the Iberian Peninsula and formed one of the most dynamic civilizations in world history. Their coexistence was tenuous, challenging, and intimate. Blood and family relations were both commingled and jealousy kept apart. Conflict, collaboration, and accommodation created new and unexpected political and economic alliances. Shared life on the peninsula generated the conditions for new forms of identity to come to life — in essence — hybridized, fractured identities that often borrowed and blended aspects of multiple faiths, values, and families. My extensive research in cathedral, municipal, and national archives has led me to conclude that Jewish, Christian, and Muslim relationships were far more integrated—both positively and negatively—than contemporary scholars and the public realize. To investigate these issues, I blend the traditional approach of the historian (painstaking research and interpretation of medieval manuscripts) with new digital technologies (crowd-sourced analysis by citizen scholars and applied geovisualization). Thus, as a digital humanist my purpose is to share this intercultural history with others, via traditional and novel mediums, so that we might learn and appreciate how 21st century human interrelations have been molded by the past. 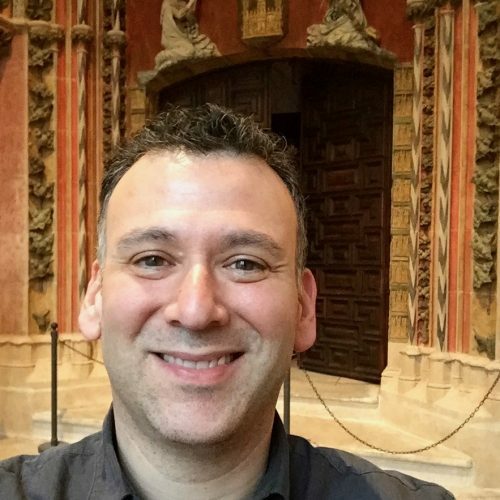 Dr. Martínez served as a guest curator at the New Mexico History Museum (Santa Fe, USA) and is the co-curator of the Fractured Faiths: Spanish Judaism, The Inquisition, and New World Identities exhibition. In the 10th through 13th centuries, Spain flowered into waves of golden ages, as Muslim, Jewish and Catholic peoples achieved new heights in science, philosophy and the arts. That triculturalism, though, endured repeated challenges, first by fundamentalist Islamic Almohads in the 12th century, then by Christian kingdoms in the late-14th century, when it finally deteriorated into dissent, segregation and riots. By 1492, when King Ferdinand and Queen Isabella unified the nation under the Catholic crown, cultural chaos roared forth. A royal edict ordered all Jews to either leave the country or convert to Catholicism within four months—or else. (A similar edict befell Muslims in 1502.) For those who converted, the Spanish Inquisition (and later, the Portuguese and Mexican Inquisitions) stood ready to prosecute any Christian who failed to abide. Violators would endure prisons, torture and death. What would you do? Repudiate the language, religion and customs of your people in order to stay in your home and with your family? Or walk away from all you owned, all you knew, and embark upon treacherous journeys across land and sea toward a life you could barely imagine? They bring to life people like Don Bernardo López de Mendizábal, a 17th-century governor of New Mexico, and his wife, Doña Teresa Aguilera y Roche. Hauled before the Inquisition in Mexico City, they were charged with—though never convicted of—being secret Jews. Fractured Faiths reunites Spanish artifacts with their New World counterparts for the first time to reveal the history of the Spanish Sephardim—the stalwarts, the converts and the hidden Jews—and their long heritage within the Americas. A global story that played out on New Mexico soil, this monumental exhibit details one of history’s most compelling chronicles of human tenacity and the power of cultural identity. In concert with the exhibit, Fresco Fine Art Publications produced a bilingual catalog of the exhibition’s most important artifacts and documents. A programming series will deepen visitors’ understanding of Jewish life in the Americas and the struggle to preserve identity against often tragic odds. Lending institutions to Fractured Faiths include Spain’s Museo de Teruel, Biblioteca Nacional de España, and Museo Sefardí; Mexico City’s Museo Franz Mayer and the Museo Nacional de Arte; and the Hispanic Society of America in New York City. Since summer 2014, we have delivered Massive Open Online Courses (MOOCs) to share the interreligious history of Spain (also known as Islamic al-Andalus and Jewish Sefarad). We work alongside of museums like the Museo Sefardi (Toledo). the Museo de Santa Cruz (Toledo), the Museo de Burgos, and the New Mexico History Museum to present compelling cultural knowledge. Further, our research efforts energize current and former MOOC students to assist with transcribing and investigating medieval manuscripts pertaining to medieval/early modern Jewish, Christian, and Muslim interrelations. We teach introductory, intermediate, and advanced Spanish paleography (or, reading old handwriting) to our students so that they can “decipher secrets” from medieval manuscripts. Through our collaborations with Spanish cathedral, municipal, and national archives we are making new collections available for investigation. Presently, our research is focused on interreligious affairs in the cities of Plasencia, Burgos, Toledo, and Granada, and their broader connections to the Iberian Peninsula. Read more. Dr. Martinez continues an active research agenda, especially in the area of applying digital tools to the study of medieval and early modern inter-religious Jewish, Catholic, and Muslim coexistence. Currently, Dr. Martinez is the project director for an emerging digital humanities project titled, Revealing Cooperation and Conflict: An Integrated Geovisual and Transcription Project for Plasencia, Spain (circa 1390-1450). 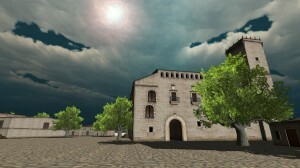 The Revealing Cooperation and Conflict project will invigorate the humanities and public’s imagination by creating a visually-compelling, data-robust, and historically-lush digital world known as Virtual Plasencia. Our endeavor will generate a 3D walk-through model of part of the city of Plasencia that reveals Jewish, Catholic, and Muslim interrelations. We aim to recreate the cooperative and challenging processes that emerged during this era of intercultural realization and violence in Spain and Europe. Our team will populate a 3D model by transcribing and indexing census-like events from Book One (1399-1453) of the Capitulary Acts of the Cathedral of Plasencia. The project assembles geovisualization experts, historians, geographers, linguists, and computer scientists in the U.S.A., Switzerland, and Spain as well as citizen scholars from around the world. Our digital world will deliver a portal for the public to immerse themselves in Virtual Plasencia and an open-access data repository for scholars. This start-up project will launch our broader team effort to model issues of identity and social disruption from the 14th-17th centuries. This international collaborative project involves Dr. Victor R. Schinazi of Eidgenössische Technische Hochschule Zürich (ETH-Zurich), as well as scholars from Idaho State University, University of Zurich, St. Anselm College, St. Louis University (Madrid Campus), University of Wyoming at Laramie, Universidad Complutense de Madrid, and the University of Colorado – Colorado Springs.